Note: All figures current to the time of publishing (6/2/2018). Eminem's discography has since achieved multiple new RIAA certifications. It's tempting to bestow Metro Boomin with the honor of bringing back the traditional "Producer/Rapper" album, but the phenomenon of a rapper working solely or heavily with one producer has existed in mainstream rap music since Sylvia Robinson produced the entirety of The Sugarhill Gang's 1980 record Sugarhill Gang. Since, there have been iconic collaborations like Eric B & Rakim, The Bomb Squad and Public Enemy, Dr. Dre and N.W.A./Snoop Dogg/Eminem, Swizz Beatz and DMX, El-P and Killer Mike, and of course, Kanye West and Jay-Z. There are too many to list, so instead, what have been the most commercially successful producer/rapper collaborations of all time? 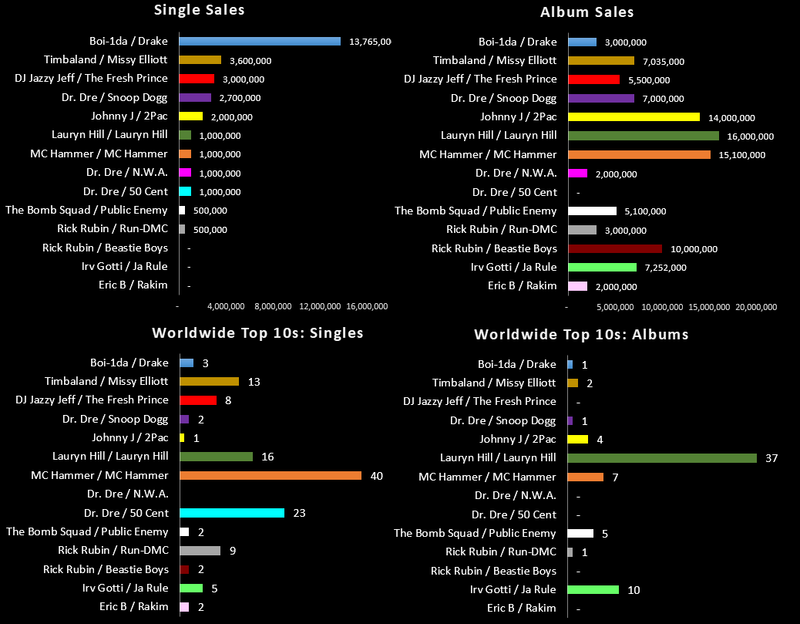 This analysis looks at the album and single sales of each collaboration, as well as their worldwide appeal via how many top 10s they achieved outside of North America. Albums in which a producer contributes 5 or more beats are attributed to the producer/rapper collaboration numbers. 5 of the top 10 collaborations between producers and artists are artists producing their own beats, for themselves or their group. Rappers producing their own tracks isn't particularly common in mainstream hip-hop, in fact outside of J. Cole, Pharrell, Mac Miller and Tyler, The Creator, most of the top-selling mainstream artists that do produce their own beats are represented in this graph. Eminem and Kanye West are two of the top-selling rappers of all time in North America, and they both produce a lot of their own music. Eminem has 166 production credits on his own work, and Kanye has 151. That they are so close is surprising; Eminem as solely a rapper has sold significantly more in North America (and worldwide) than Kanye, but Kanye is undoubtedly the better and more decorated producer. The mix of albums and singles is interesting too. Eminem has two Diamond albums in The Marshall Mathers LP and The Eminem Show, records he produced the bulk of the songs for. His greatest hits Curtain Call also went 7x Platinum. His singles numbers include the Diamond selling "Not Afraid", along with "Lose Yourself" which is certified 5x Platinum. 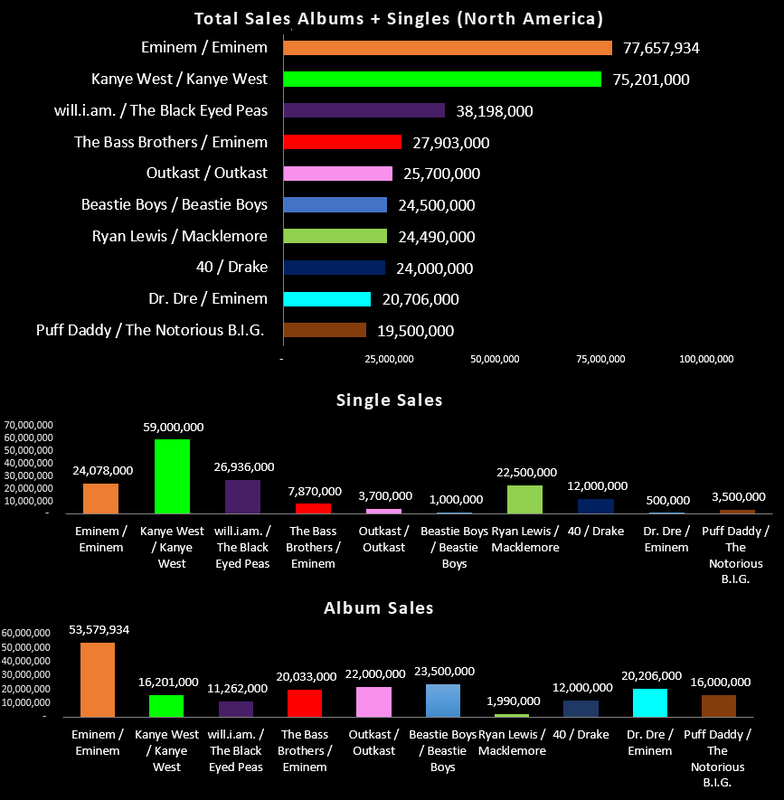 Kanye's sales come mostly from the huge singles he's helmed. There are no Diamond certifications, but he has consistently gone platinum since "All Falls Down", back in 2004. In total, 25 of the tracks he has produced and is listed as the lead artist on have gone Platinum or better. 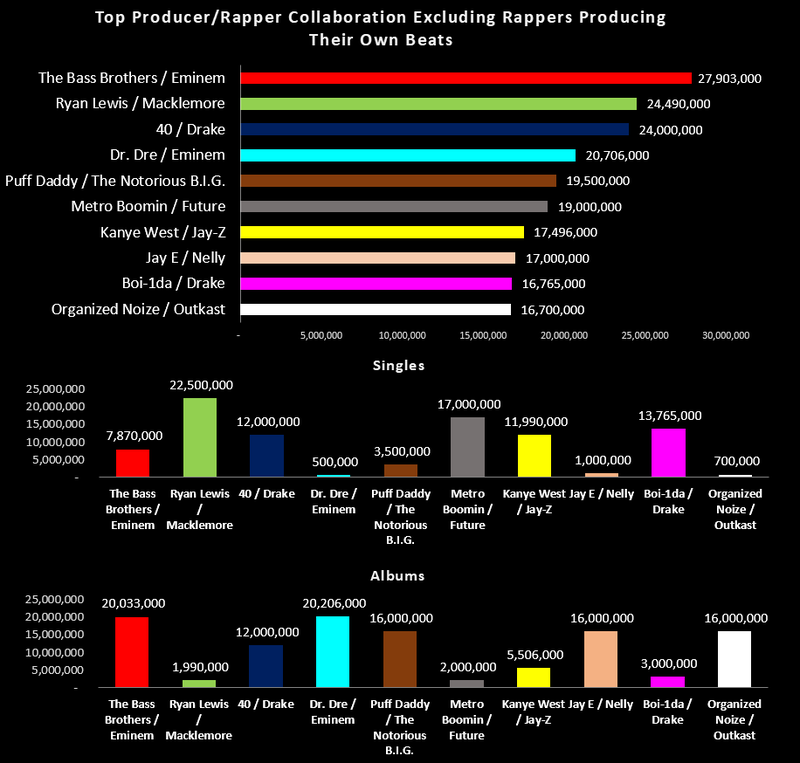 Eminem's rap career is responsible for 3 of the top 10 producer/artist collaborations on this list. The Bass Brothers, Mark and Jeff Bass from Detroit, were pivotal in Em's early career success with The Slim Shady LP and The Marshall Mathers LP. And Dr. Dre's influence was instrumental in giving Eminem the tools and the confidence to produce his own music. The Bass Brothers and Eminem enjoyed unbridled success early in Eminem's career. They helped produce 1997's The Slim Shady EP, the tape that earned Em his record deal, and they, alongside Dr. Dre, created the sonic landscape that Eminem used to ascend mainstream heights that no rapper before or since has come close to. The Bass Brothers produced 11 of the 14 non-skit tracks on The Slim Shady LP (10 of those alongisde Eminem), and had 5 or more credits on The Marshall Mathers LP, Devils Night (D12) and The Eminem Show. They would produce for Eminem again, but not until 2009's Relapse with "Beautiful" and "Underground". Macklemore & Ryan Lewis' dominance from 2011-2015 resulted in 22.5 million single sales, with 1 Diamond certification. "Thrift Shop" became an anthem, and the chemistry between the two artists was hammered home when Macklemore split with his producer for 2017's Gemini, a record that sold just 51,000 copies first week, and is yet to have an RIAA certification. His solo singles have underperformed as well, with none of them making it past 49 on the Billboard Hot 100. Drake's relationship with Toronto producer Noah "40" Shebib may be the most influential one on this list. Not only has their trademark introspective and slightly downtrodden vibe soundtracked a new school of mainstream production and propagated a generation of more emotion-focused rappers, they've given rise to Toronto as a genuine mainstream force. Just as Nelly opened up St. Louis rap to the entire North American market, Drake helped bring Toronto to the forefront, and created a platform for artists like The Weeknd, BADBADNOTGOOD, dvsn, Nav, and a thriving hip-hop underground. The rest of the collaborations on this list are quite straightforward. Puff Daddy and The Notorious B.I.G. found the perfect mix of sleek style and gritty rhymes from 1994-1997, a sound that influenced a young Jay-Z and showed him the path to commercial success. Jay used that nous to link up with Kanye West for 2001's The Blueprint, an album that combined stylish, elegant soul-samples with street knowledge and the most opulent braggadocio to create a sound that was both influential and enduring, as well as commercially successful. Organized Noize are genuine legends in hip-hop and R&B production, working heavily with Goodie Mob, TLC and Ludacris, but they found runaway success alongside Big Boi and Andre 3000 of Outkast. The first four albums from the Atlanta duo were given direction and sound by Organized Noize in the famous Dungeon, and their sound was defined by live instrumentation and a full, rich "band-like" wall of noise that helped Outkast celebrate Atlanta culture and put it on the hip-hop map. The Jay E / Nelly numbers are helped by Nelly's Diamond-selling debut Country Grammar and his 6x Platinum second album Nellyville. The list would be incomplete without Metro Boomin's work with Future. The two linked up to create what will likely become the trap bible in DS2, and it was Metro who snapped Future out of his Honest "popstar" phase with the gritty, aggressive, and downtrodden mixtape Monster in 2014. The two have crafted some huge singles as well, with "Where Ya At", "Jumpman", "Low Life" and "Mask Off" all going multi-platinum. This list isn't exhaustive, but it gives a good idea of the worldwide impact of some specific collaborations. Eminem has sold hundreds of millions of singles and albums worldwide, so it's unsurprising he would top the list, and bring The Bass Brothers and Dr. Dre along as well. The Black Eyed Peas, since their Fergie-led reboot in 2003, exploded in popularity on the world stage, selling more than 8 million copies of Elephunk, Monkey Business and The E.N.D. Missing from the list is The Beastie Boys, who achieved success at a time when rap was still very much limited to North America, and hadn't yet expanded globally. When CyHi The Prince told the Grass Roots podcast that Kanye would be producing entire projects for CyHi, Pusha-T, Teyana Taylor AND Kid Cudi, not to mention Kanye's own next LP, rap fans started looking towards 2018 with hunger. Metro Boomin (who was the most commercially successful rap producer of 2017 by a huge margin) set the tone in 2017 with 4 separate projects on which he produced every (or nearly every) track, and it may usher in an era where producers begin to get equal billing with rappers when they work together for an entire project. Sales are based off available data, meaning RIAA certifications and numbers released by the various sales monitoring outlets. One-off collabs like Wiz Khalifa and DJ Frank E weren't included in the analysis, but the only chart they would affect is the "worldwide top 10s" ranking. Single songs with multiple producers and huge overseas success would dominate the chart. Any album a producer delivers 5 or more beats to is added to the album statistics for that collaboration. Such contribution represents a distinct influence on the sound and feel of the entire project. The final graph isn't a definitive ranking, it's just meant as a guide to show how successful certain collaborations have been worldwide. Sales can fluctuate between eras, but it's the only way to measure commercial success. Manually counting how long every single collaborative song or album spent in the Billboard charts is impossible, and a lot of information doesn't exist prior to 2000.